Preheat oven to 450 degrees (230 degrees C). Coat a large roasting pan with cooking spray. 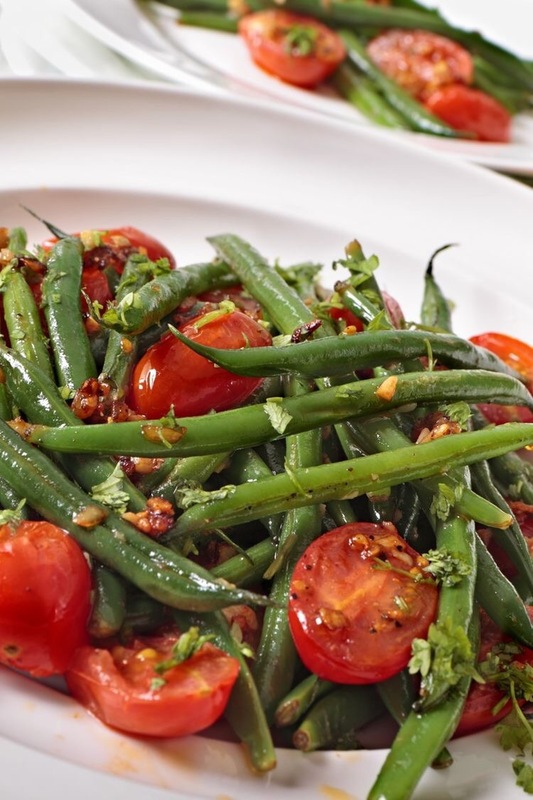 Place green beans in a single layer on prepared pan. Roast until desired doneness, stirring once or twice, about 10 to 15 minutes for fresh or 25 minutes if using frozen. Meanwhile, in a medium bowl, combine tomatoes, basil, garlic, salt, and pepper; set aside. When the green beans are finished, remove them from the oven, add tomato mixture to pan, and gently mix until thoroughly combined. Recipe originally inspired by Food.com with 5-star rating and 10 reviews.